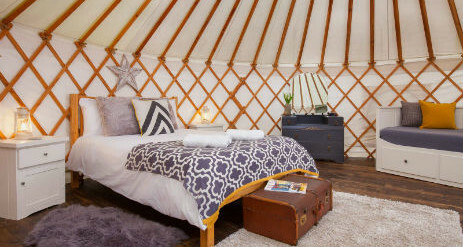 The Yurt Retreat and the Bird House in Somerset is a Glamping site exclusively for Adults nestled at the foot of Castle Hill, where four luxurious yurts and a treehouse welcome you to a slower pace of life. The Yurts are well appointed with private bathrooms, luxury showers and use of the spacious lodge with a farmhouse kitchen and comfy lounge while the Birdhouse is completely self contained with all the comforts and facilities you’d expect to find at home. The site is tucked away in a stunning natural setting with abundant wildlife yet easily accessible by road and rail. We are only just over a mile from the award winning Gastro pub, The Lord Poulett Arms in Hinton St George, just 2 miles from Waitrose and the leisure center in Crewkerne, and just 30 minutes by car to Lyme Regis and the iconic Jurassic coast. 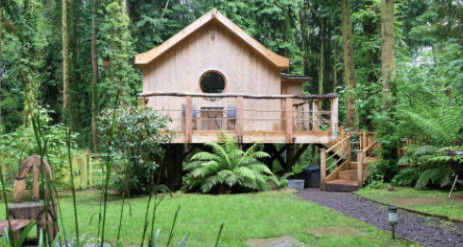 The Yurt Retreat comprises of four, luxury, 20 foot yurts sleeping 2 to 4 people, each sat on its own beautiful, coast redwood platform, with a deck offering unspoilt countryside views and your own private bathroom. Each yurt is made with a beautiful canvas covered wooden lattice with a stunning crown of hand-sculpted wood, forming the centre piece of the ceiling. 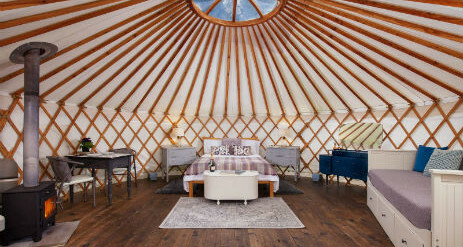 Each yurt is individually styled from cool Skandi greys and yellows to sumptuous rich vintage. There is a comfortable double bed with egyptian cotton bed linen and towels and a sofa bed, so that each yurt can sleep up to 4 people. There is mains electricity and bedside lights. Your own wood burner provides a warming focal point to the yurt and for those warm and cosy evenings under the canvas, you have your own tea and coffee making facilities and outside, your own BBQ. Behind your yurt is a personal bathroom with flushing toilet and sink, housed in a cedar clad building topped off with wooden shingles. You also have your own shower housed in the ‘The Lodge’ so that you can leave your towels and toiletries in there if you wish. The Lodge, our communal building, sits at the heart of the the Yurt Retreat. Each of the four Yurts are tucked around it and at the edge of woodland. 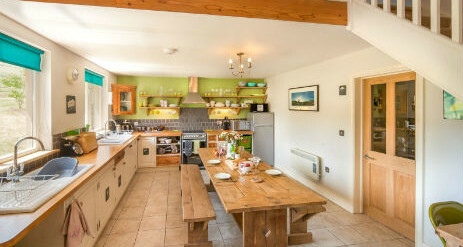 The Lodge contains a beautiful country kitchen, with a large table big enough for everyone to fit around. Each Yurt has it’s own food cupboard and crockery as well as a shelf in the fridge ( there is a small freezer compartment to share). We’ve included all the pots, pans and utensils you could need. There’s even an Iron in case you’re heading out to the Lord Poulet Arms! There is a lounge in the roof of the building where you can sit to read or watch a film on our comfy giant bean bags. We have just upgraded the TV to a Samsung smart TV but it’s just connected to the DVD player. We have deliberately chosen not to have a TV aerial as we feel that the setting is far more beautiful than any soap opera! You will find a handy bathroom upstairs. Three of the Yurts have their showers in the Lodge. They are powered by a state of the art German Solar hot water system and are all spacious double showers. Each shower is private to your Yurt so you can leave your toiletries and towels right where you need them. The Bird house is a stilted Treehouse in the woodland behind the Yurts. You enter the site through a gate in the Hornbeam hedge and find a clearing alive with birdsong. The Bird house stands at the far edge on its tree trunk stilts. It’s clad in local Cedar and the first impression is of a giant bird box with its large round window. There is a wide staircase which winds between the trees leading you up onto the ample decking where you can breakfast overlooking your own woodland retreat. Once you take a step inside the treehouse you enter into your own designed retreat. You will find a high vaulted ceiling with flowing curved walls and roof all lit by incredible windows which frame views of the trunks and leaves outside. Every element of the interior has been carefully considered to provide you with a complete and beautiful home in this stunning setting. 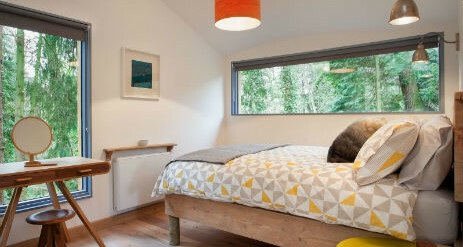 The handmade bed will have you waking refreshed to inspiring views through the two picture windows. You can ease into the day under the rain head shower then cook breakfast in the fully equipped kitchen. Whilst the appliances are beautiful, stainless and German the bespoke kitchen is clad in 80 year old boards reclaimed from the parachute regiment nissen huts from Salisbury Plain. You can eat around the handmade dining table or just lounge on the comfy sofa. 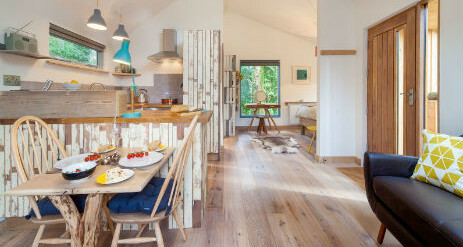 By renting the Birdhouse you can experience the vibrancy of life in the woodland whilst also being able to retreat into your own personal sanctuary. For a truly memorable experience why not book the whole of the yurt retreat including our New Treehouse. Having the place to yourselves to star gaze, light the fire pit or cook a special meal together without disturbing other campers, helps you to create an occasion that you will never forget. Groups can book all 4 Yurts and the Treehouse together. Each yurt will only sleep 2 people and the Treehouse will sleep 2 people. Maximum of 10 people. Incredible space with 9 double beds for 10 people, generous communal kitchen and a snug. Here at the Yurt Retreat we offer you the chance to create the relaxed and unique celebration you’ve always dreamed about. Whether you want a bunting decked marquee or a stretch Yurt, a standing buffet or regal feast we leave the important decisions to you. With Luxury toilets, electricity and plenty of parking right by the marquee you’ll hardly believe you’re in such beautiful surroundings. All this, coupled with exclusive hire of our Glamping accommodation with the option to hire the nearby Fordscroft Cottages, everything you need is at hand. SEE THE SHEPHERDS HUT RETREAT HERE!